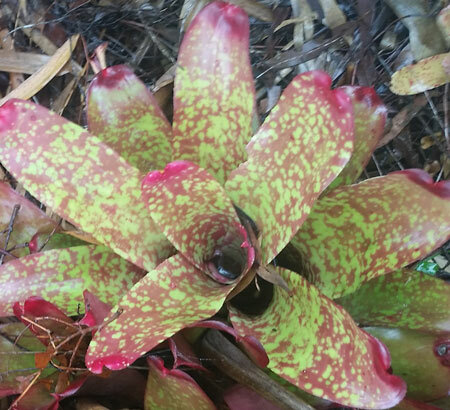 With a pretty red and green mottling, Neoregelia cosmos is a colourful, hardy groundcover. Likes a well lit position, can handle full sun for part of the day. Plant under trees so the fallen leaves landing in the vase of the bromeliad provide all the necessary nutrients. Prefers an Orchid potting mix or a porous mixture such as equal parts bark chips, humus, peat moss and sand. During the growing season it is advisable to keep water in the funnel at the centre of the rosette most of the time. Keep the soil barely moist - only water when the soil is dry to the touch. If the plant is growing well but does not flower, try wrapping it in a plastic bag with some ripe apples for a few days. The ethylene gas released by the apples should induce flowering.